Here's a pretty visitor to the trap: a Brown China Mark. It's officially a micro-moth but it's time that someone promoted it to the first division. Micro-moths are separated from macros for reasons dear to my heart, ie not some scientific distinction to do with genitalia but simply on grounds of size. Trying to distinguish between tiny pug moths didn't appeal to early entomologists who set the nomenclature any more than it does to me. The Brown China Mark, like the Mother of Pearl which features in last year's journal here, is easily big enough to be a macro. It's also interesting because its caterpillar is amphibious. We have a small pond (or as our neighbours' grandchildren call it, The Swamp) so that may explain its presence. It also seems to be taking an intelligent interest in Morrison's advice on eggs. A propos yesterday's dragonfly, here is another picture of a Southern Hawker, showing that it has a rather grisly connection with butterflies and moths. I've pinched it from the website of the British Dragonfly Society but I hope they won't mind if I say again how brilliant they are. btw do you remember that T'Pau song in my title? I listened to it constantly in Bart's Hospital in London after I was knocked off my motorbike outside the Guardian and had my leg broken. I still hum it. Another first for this journal today: we've had eels, crabs and even a snake. Now here's a dragonfly debut. I'm sorry it's a bit blurred but I couldn't get nearer; like the little warriors in Philip Pullman's His Dark Materials trilogy, they are superfast flyers. This one was in the grounds of Shandy Hall at Coxwold, famed home of Laurence Sterne of Tristram Shandy (See www.shandean.org). What a garden! The house is fascinating, too, and the director of the Sterne Trust, Patrick Wildgust, is a marvellously enthusiastic curator and guide. I emailed him the dragonfly, the season's first sighting there (does anyone know what kind it is? I will research meanwhile. Update: I think it's a female Common Hawker judging by the excellent website of the British Dragonfly Society. A common hawker is one of those people cited in window notices by people who also don't want canvassers or Jehovah's Witnesses. They would if they looked like this. Stop press: No, maybe not. See helpful Comment. Patrick sent back this startling picture of a Death's Head hawk moth. It was part of a project by the local primary school and also starred in an exhibition on moths at the hall, where moth traps are regularly run. 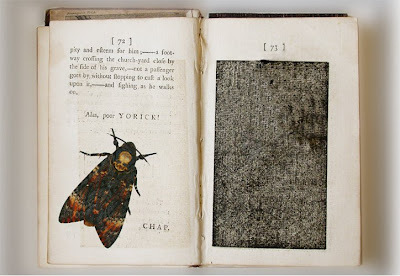 The next exhibition is going to feature a collection of famous artists reinterpreting the celebrated black page, shown with the moth. This idea was picked up by Lemony Snicket in his Shandyesque A Series of Unfortunate Events, which is on the hall's bookladen shelves. So is a condensed Tristram Shandy issued to US troops during the Second World War, along with 399 other classics, apparently to remind them what they were fighting for. 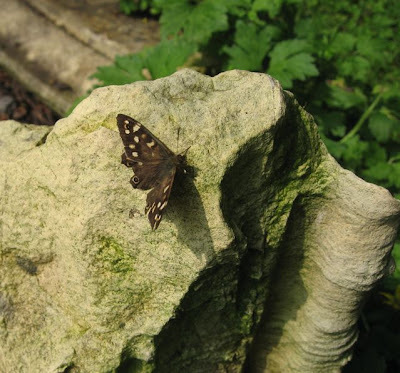 Here's a Speckled Wood from Tristram's garden too. I'm going to live off yesterday's moths for a few days, like some sort of entomological camel. We've got a friend staying and if I operated the trap, he might be kept awake all night by its unearthly glow. Mind you, our spare room has luminous planets on the ceiling left over from the children's days, so it's already a spooky place to sleep. This looks to me like a Gothic moth, which is nice because they are another of the species described as 'local' rather than common in Waring & Townsend. There are various other Gothics which look a bit similar but they are even less common, so that's what I'm opting for. It's one of those moths which make you say "Ah!" when you spot them in the trap, because the marking is so distinctive. Here's a pic of Gothic windows, too, for you to decide whether those responsible for christening the Gothic were correct to do so. I'm afraid there isn't a Perpendicular or Baroque moth, let alone a Post Modern. But there are thought to be plenty of species still undiscovered in remote parts of the world, so wait on. Help! Stop! The moths are pouring in now and I am overwhelmed. Grey Daggers, Light Emeralds, the first of the various yellow underwings... it's madness. Mind you, I turned the trap on unusually early last night, after going outside at 9.30 and noticing that moths were already on the wing, although it was still quite light. Who can blame them? Dusk is a lovely time, with the air still warm at this time of the year, the wind usually still and scents very strong. Here's a picture of the trap in its usual setting, with rather more of the background showing than usual because of the good light. Penny is responsible for the rockery, I should add, although I help with weed destruction. Also, below, some of last night's customers. The micro - is it a Large Fruit-tree Tortrix someone? - isn't actually molesting the Light Emerald. The trap's transparent collar forms a chastity screen. 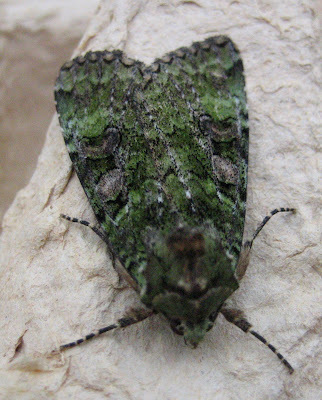 The two Light Emeralds snucked into the eggbox with a blurry Peppered moth and something I'll identify later, give a better idea of their actual colour. Lovely. If you double click on the pic, btw, it gets a lot bigger and you can see that they look like two beautiful grounded gliders. Moths and butterflies have yet to feature on Wimbledon TV coverage, unlike various sorts of bird which make occasional appearances to the crowds' delight. But here's a posed tribute to the tournament, although this Spectacle moth was getting a bit narked by my gentle poking it into position with a wisteria flower stalk. It's poised for take-off, and take-off is what it subsequently did. One thing about Spectacle moths: they wear well. They've been coming to the trap regularly for over a month now but they still look in good shape, not at all tatty or torn. Maybe they have a 'rolling generation' and I keep getting new ones. Here's another handsome arrival in the trap too: a Beautiful Golden Y, understandably-named. Observe also my beautiful thumb. Warm nights, good moths, happy times. 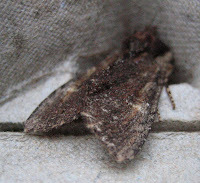 The moth season is really under way now, and the trap was like Noah's Ark this morning. 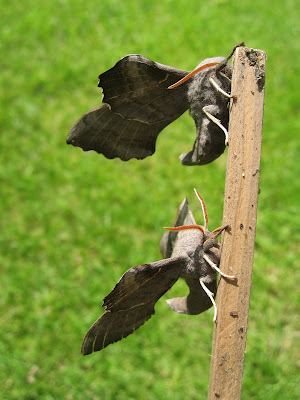 Two Poplar Hawks, two Burnished Brass, two Buff Arches. 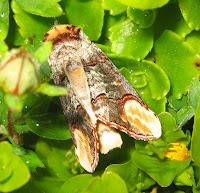 There were Three Green Arches too, a Dark Arches and the first of the yellow underwings which will crowd in from now on. They are the aces at creeping right down inside the egg cones. The metallic scales of the Burnished Brass are lovely; if the moth is sleepy, as these were, you can twist their leaf around and watch the reflected light glint and fade. I also had this year's first Snouth moth this morning with its long upturned palps, but unlike these dozy pairs, it was wide awake and scooted away. That's an old rocket stick the Poplar Hawks are on, in case you were wondering. People were celebrating the Longest Day yesterday (and Father's Day, yo! ), and very summery and warm it was. But spare a thought for the moths. They must have been grumbling about the Shortest Night. I put the trap at the end of its wire again but I won't repeat this exercise because for the first time ever something - a fox, deer or conceivably squirrel - interfered with it and dislodged the top. Luckily the lamp didn't break and the moths slept on, including this Common Footman and the one by all the egg propaganda which I will try to identify at leisure. Tomorrow, weather permitting, we'll be back to the flowerbed site. Let's have some butterflies for a change. We were gardening yesterday and these two Meadow Browns came and joined us, like robins. They're the first I've seen this year and they look newly-hatched with that soft, light fringe to their wings still intact. 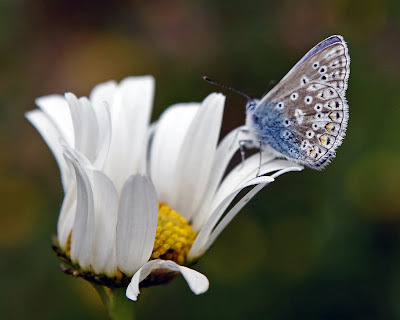 As Prof Edmund Ford discovered, when he studied the species intently in the Scillies, Meadow Browns are home lovers, and our pair didn't stray more than 15 yards from the patch of long grass, buttercups and vetch where they live. Having said that, one was caught at the Royal Sovereign light vessel, seven miles out to sea off Eastbourne. 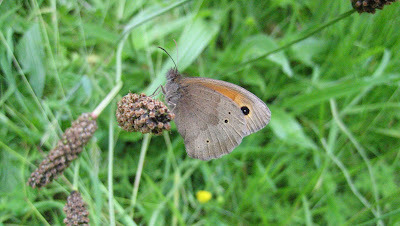 They tend to fold their wings if they sense a large person approaching with a Canon Ixus, and I had despaired of getting a picture of one sunning itself with its wings wide open. But Lo! I was just heading back in with my spade and trowel for tea, when I saw this one. It was so well-behaved that I thought it might have gone to sleep. Eventually I tickled it with a plantain and off it went. 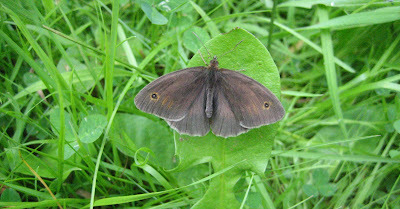 We've had Speckled Woods out too and should be getting Ringlets soon. It's Saturday and I am writing this in bed at this disgracefully late hour, with Penny, my cup of tea and Messrs Waring, Townsend & Lewington comfortably to hand. But enough of me. This is about moths. Last night I unrolled the cable to its maximum extent, which must be some 80 yards, and trapped in a bit of shady undergrowth below silver birch trees. The main result was this mass of small flies (What are they? Does anyone know? Click on pic for full horror), plus some larger ones including a fine-looking green beast, a bumble bee and two wasps. Moths were far fewer than in the open area near flowers where I normally operate. But there were a few: carpets and waves which fluttered off, and this pair. Following Norman's advice yesterday, I think that the top one is a Small Clouded Brindle. It looks more like a Common Rustic or Lesser Common Rustic to my hopeless eye, but their flight season doesn't really start until July and this moth is already rather worn. I was hoping that the other one was an Uncertain, which I rank mentally as one of a trio of moths who could be characters in a crime drama, the others being the Suspected and the Confused. 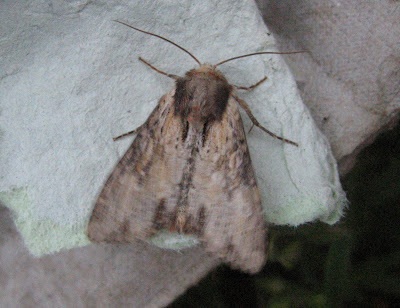 But Penny thinks it's a Mottled Rustic after looking at WT&L closely and I fear that she is right. As they used to say in Blind Date, the decision is yours. PS Note the photographic debut of the trap's electric cable connector. 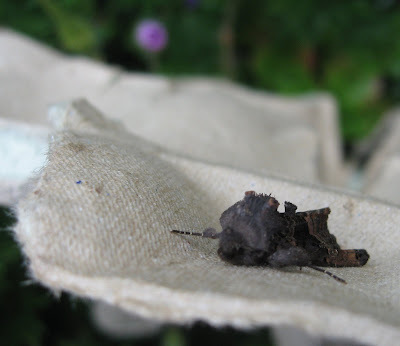 It was windy last night but I put the trap out, partly to see if the weather has any effect on moth operations. Overnight it has rained a little, so that must have been a deterrent too, but there were eight Heart and Darts tucked into the egg boxes, plus this quartet. The yellow one is a Brimstone moth, whose eponymous butterfly counterpart is one of the best arrivals here in Leeds during our time (although I haven't yet seen one this year). 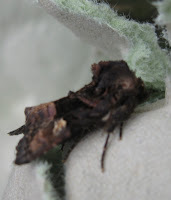 Then we've a Marbled Minor, the pretty one with the black and silver colouring, and (I think...) a Common Rustic nosing its way into an egg cone. But what is this other one, with blurred wings - the result of my disturbing it rather than camera shake. (Stop Press: see helpful Comment) It's a classic example of why I have trouble identifying moths. But I'm going back to bed and my morning tea now, to see if I can work it out. Another thing I need to work out is how to get rid of that lonely little 'the' above, a printer's widow, but at the moment I can't. 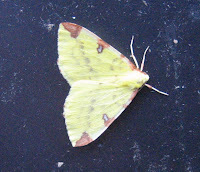 I gave the moths a break last night, with the weather looking dodgy, though in the end it stayed dry. So here, for now, is the much-featured Pale Tussock visiting again the other night and trying out a perch I haven't seen before. It's chosen one of the struts which support the mercury vapour lamp's rain cap (a Heath Robinsonish but surprisingly effective device). That brings it incredibly close to a bulb so bright that Watkins & Doncaster advise human users not to look at it directly. Not surprisingly, the moth was sound asleep in the morning and stayed that way 'til after lunch. Luckily the birds didn't notice it. That or they prefer the worms which the rain has brought to the surface in large numbers. Uh-oh... As you'll have seen if you follow the Comments here, all my erudition about Prominents yesterday was off the mark. Sticking to my inglorious record of getting identification wrong (my wife says I would be a nightmare police witness - well, officer, he was short but a bit tall, with blond hair which may have been slightly black...), I mistook for an Iron Prominent what is actually a Small Angle Shades (sounds like a product from Christopher Wray). Many apologies. I should have known, as the SAS is another of the regular visitors here which are coming obediently to the trap in more-or-less the same order as they did last year. It features in last year's blog too. Oh well. 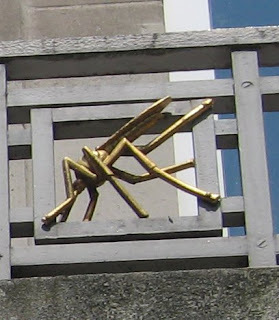 As a result of this, I won't dare to identify these glorious insects which always cheer me up when I pass the London School of Hygiene and Tropical Medicine, as I did last week. 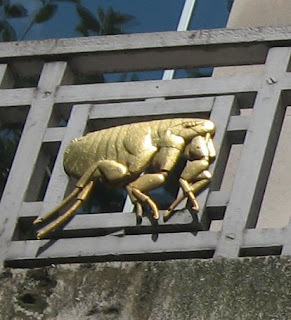 In an excellent artistic stroke, the main building is surrounded by sculptures of exotic natural enemies to human health, including a snake but mostly insects. A couple of Iron Prominents this morning, one a little less prominent than the other. (But, aagh, see Comments and post above...) They get their name from the Mohican-style tuft on their backs when at rest which adds to the Star Warsy, science fiction effect, specially with that little purple planet in the background in my main pic. 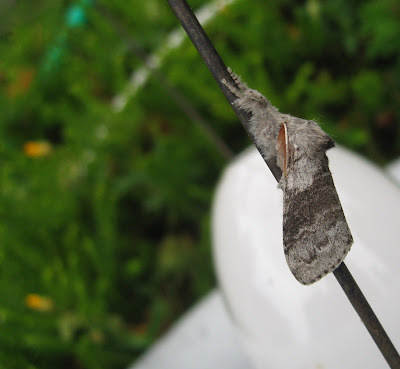 The tuft is actually a spur on the edge of their forewings which sticks up when the wings fold, breaking the moth's outline in the familiar way of camouflage. 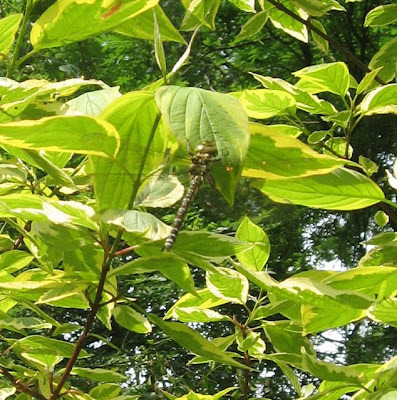 The subtle colours and patterns also help with disguise, specially if the insect is on bark or dead leaves. The Prominent family are another example of how unfair the world's distribution of moths is to the UK and Ireland. There are 2,500 different Prominents altogether. We have 27, and one of them, the beautiful White Prominent, was last seen in 1938. Another, the Three-humped Prominent which sounds a bit miserable, was caught on a lighted shop window in Southwold in 1884, but has only been back ten times since then. I compared the Flame moth to a fag-end a couple of days ago. Now here's a filtered version - though more like a cigar, perhaps. It's a Buff Tip which visited last night; a well-known example of camouflage mimicry. Spot one at rest on a broken birch twig, which I'm afraid I didn't have handy, and it's hard to tell the difference. It was lovely and warm yesterday evening, perhaps the most summery night of the year so far, but some time later it rained. 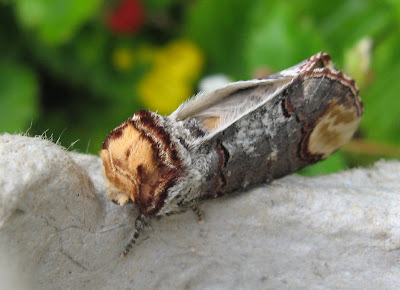 There was a big moth already zooming about when I turned the trap on at about 10.30pm, but it probably wasn't this one; moth experts' data shows that Buff Tips usually come to light-traps after midnight. That's another retirement project: the flight times of different moths. But will I have the stamina to stay up late? 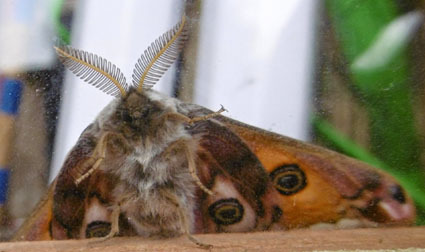 If not, I could maybe instal the moths' very own mini-CCTV system. After writing my headline, incidentally, I realised that I didn't know the origin of the phrase so I Googled and Wiki-ied and it's all on http://en.wikipedia.org/wiki/Buffs_(Royal_East_Kent_Regiment), and very interesting it is too. Sorry about the quality of the photographs today, but I've been in London for a mothless trip. I managed this sneak pic of an exhibit at the Royal Academy's summer exhibition, which is a wild and whacky mix as usual. The Guardian critic said it depressed him, but he must be a rather sensitive soul. Exhibit No 787 (out of 1266) for instance is Butterfly Can (Motorised) by Tim Lewis of East London. I wouldn't pay the asking price of £2,800 or anything like it, but it's a fun object, with the butterfly snipped out of the pop can's side, then fixed on the lid and motorised so that it opens and shuts its wings. 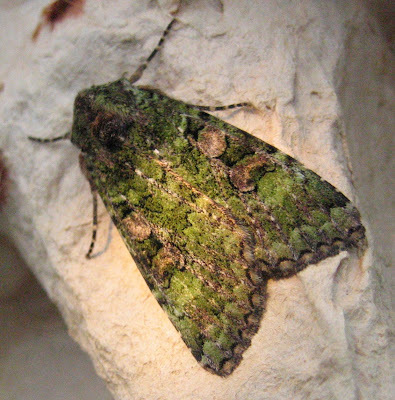 Meet the finest of all the green moths which come regularly to my garden: the Green Arches. Last year, I had little success in photographing these - if you scroll back to July and August, there are a couple of pictures but the specimens were battered and had lost their lustre. Only last week I was moaning, too, about not being able to get a decent shot of a GA which crept right into an eggbox pyramid and hid there. Better luck this time, at least I hope you agree. Continuing my adventures in photography, I've done one straightforwardly and the other with a pocket torch gripped between my teeth like some modern film director. On that score, isn't it great that Bradford has been named as Unesco's first City of Film (in the world). No doubt LA and Cannes will catch up, but hooray for the setting of Billy Liar and birthplace of Simon Beaufoy whose Slumdog Millionaire deservedly got eight Oscars. (But seriously, what is it? I would call it the Fag-end. It came a couple of nights ago and it's certainly distinctive. Judging by its shoulder mark, it's a lance-corporal. The Flame looks the likeliest bet, but I am usually wrong. Solutions gratefully received). Here's an interesting visitor: a Scorched Wing. Most of the moths in my trap are described in my book as Common, lovely though they are. This one is Local. That isn't in the Royston Vazey sense, that it runs a local shop and asks you in a tiny but threatening voice: "Can I help you at all?" It means that it tends to be found a more limited number of areas. I'm glad that Leeds is one. Its name comes from the darkened, trailing corners of its wings, although the almost op-art, mobile form of its wider colouring is what interests me. Modern artists have been inspired by this sort of thing. Damien Hirst was brought up about a mile-and-a-half from where I'm writing this, so maybe he encountered one as well. Look at its tail too. 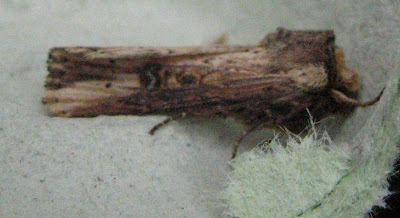 That means that it's a male - a habit of curling the body which happens in several other similar, small moths. The absolutely brilliant paintings in Waring and Townsend, by Richard Lewington, faithfully illustrate this. 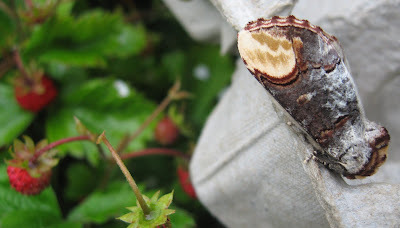 The caterpillar of the Scorched Wing (photo from W&T, thanks) is a marvellous example of mimicry. More room for Darwinian thoughts here, although I've got to get on now with something else. btw my noble Guardian colleague Jane Perrone got me to do an entry on her excellent gardening blog for the paper which you can read, if you haven't had enough on www.guardian.co.uk/lifeandstyle/gardening-blog/2009/jun/08/moths Actually she refers back to this blog, so if you want, you can also ping pong too and fro. My niece Jessie has sent me this startling picture from the Sun (whose headline I have shamelessly borrowed). The power of cocoon spinning is pretty awesome. But then think where silk comes from - plus the item on the news this week about scientists testing spider thread for other uses. I would have thought that they'd done that by now, but there's so much that we still don't understand in the natural world. This eerie picture comes from Spuikade, Holland, where the caterpillars have made their communal nest after stripping the leaves from nearby trees. 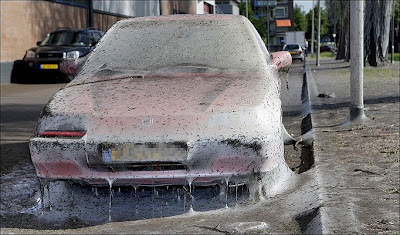 (As one Sun reader advises on the thread - appropriate term: don't park under trees). By coincidence, my American pal Sarah comments on exactly this phenomenon two entries below. 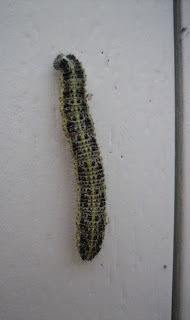 and a few of its caterpillars, which you do get in the UK, so beware. Spindle is the shrub Euonymus which I must admit, I never knew. Thank you, Jessie and the Sun. Not all the moths we find here come to the trap. This is a Common Marbled Carpet which spent yesterday evening on our bathroom roller blind. I persuaded it outside to avoid a fate like that of the last Caliph of Baghdad who was rolled up in a carpet and smothered by Ghengis Khan's Mongols in 1258. I like this variant because even I can easily identify it; other forms of the CMC are frustratingly like lots of the (many,many) other carpet moths. Penny likes it because of the tasteful way its wing patches co-ordinate with the russet background. 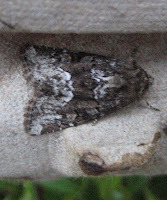 It would be very un-Darwinian to suggest that Common Marbled Carpet was aware of this, but ever since a Peppered Moth chose an eggbox barcode to snooze on (see last year's blog, many a scroll-click down), I have wondered. Here's the year's first caterpillar, pictured making a break from one of our veg beds where Penny and I have been frantically gardening in between attending late night, and very depressing, election counts. It's a Large White, I think, although generally they're outnumbered here by their Small and Green-veined relatives; I shall do some research later when time allows. It was twisting its head (the bit at the top of the pic) nervously about in a way which I've noticed before in fully-grown caterpillars. Either it's a symptom of The Change coming, which is pretty spectacular; imagine turning from something squashy and soft like this into a hard, sharp-edged chrysalis. Or it's got an infestation from a parasitic wasp, a very nasty fate but Nature's helping hand for those of us who grow cabbages.